Senate of Pakistan One Year Paid Summer Internship Program 2018. The Senate of Pakistan internship program is fully owned, conceived and it is also administered by the Senate and it has taken various initiatives with the involvement of third parties or the development agencies. It is necessary to get the youth of Pakistan and you need to give them exposure. We also believe that it will be two way learning process. The youth will have to learn a lot and the Senate will draw on their talents, energies and latest ideas through the Senate of Pakistan One Year Paid Summer Internship Program 2018. Do you want to work with the Upper House of Parliament, which is called Senate? Are you taking interest in getting the hands-on experience how the legislation is done and how the work of Committee and the House of Federation functions? How have about the direct interaction with the elected representatives? Students, who have completed 16 years of education from HEC recognized Islamabad based Universities will be selected for the internship program. CGPA 3.0 in semester System OR 605% Marks in Annual System. Law, Political Science, Public/ Business, Administration, International Relations, Economics/ Finance, Computer Science/IT, Media, Social Sciences and English/ Linguistics. 25,000 PKR will be awarded in Senate of Pakistan One Year Paid Summer Internship Program. Rs. 15,000 – 25,000 per month all inclusive and the amount of stipend will be finalized before commencement of the internship. Students will have to arrange for their boarding/ lodging and transport on their own. Current students are not eligible to apply for Senate of Pakistan One Year Paid Summer Internship Program. The candidates, who have completed 16 years of education from Islamabad based Universities are eligible to apply. After receipt of the applications, shortlisted candidates will be called for the interview at Islamabad. All applications for internship shall send to the undersigned on or before 20th May 2018. The internship application will be supported by the certificate signed and stamped by Registrar of the last University attended mentioning that candidate had remained a bonafide student and is currently not enrolled in an academic program. Incomplete applications and late submissions shall not be considered. The internship will be governed by the terms and conditions provided on the next page. Any violation of these terms and conditions will render the internship liable to termination and/or any other proceedings as may be decided. 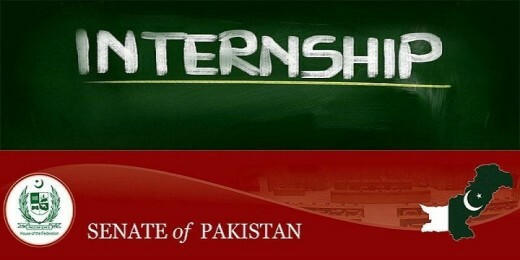 The Senate Secretariat will make a final selection of the interns for one year Internship Program as per requirements. The Internship is not an offer of employment in any way nor does it confer any right to the intern for a continuance of internship after one year. The intern will not be entitled to any accommodation, traveling expenses, transport to duty, medical facilities or any other benefits during Internship. The duration of the internship will be one year and the intern shall be entitled to 2 days leave for each month of internship. All interns would be required to work FULL TIME in the Senate Secretariat, including late hours during Senate Sessions, Committee meetings or any other special occasions. Every intern will be required to submit printed documents of contribution/work done – such as briefs, policy papers, press releases, social media posts and other tools applied for publicity of/creating awareness about Committee’s work and long-term research carried out for the Committee on policy issues. Download the Internship Performa Given below. Fill the form and send it to the given address below.